Otoplasty or bat ear correction is a procedure to surgically correct protruding ears by setting them back closer to the head. Also known as pinnaplasty, the goal of the procedure is to set back the ears in such a way that the angle is normal, contours appear soft and both ears are symmetric, with no telltale signs of surgery. Protruding ears often lack a normal fold, which is what causes them to stick out. The aim of the procedure is to create a more pronounced fold in the central portion of the ear by altering the cartilage. It is often indicated for those who are dissatisfied with the natural shape of their ear or when an injury has deformed the normal shape. One should be at least 5 years of age to undergo the procedure. What to expect before the procedure? You will be advised to stop smoking at least four weeks before surgery. Besides, the surgeon shall advice you to avoid certain medications such as Aspirin (blood thinning agents). 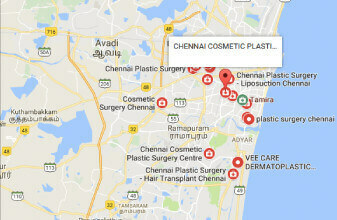 At Chennai Plastic Surgery, the procedure is performed under local anaesthesia. However, for children general anesthesia is preferred. The entire procedure should take about an hour and a half. A small incision is placed in the crease behind the ear and some skin excised, thereby exposing the underlying cartilage. Next, folds of the ear are recreated by adjusting the shape of the cartilage to create the missing folds and the skin is redraped. The re-contoured cartilage and covering skin are held in place with sutures, naturally drawing the ear closer to the head. The ear is finally secured with a turban style bandage. You can return home the same day. What to expect after the Otoplasty procedure? After a couple of days, the bandages are replaced with a lighter dressing and the external stitches removed after a week. You can resume work within 5 to 7 working days. What are the risks associated with the procedure? Risks involved in this procedure are very minimal but overcorrection and asymmetry is a probability besides chances of developing scars, hematoma and infection.